Using our revolutionary jig-off tungsten beads you can tie jig nymphs without using a jig hook. A standard fly hook with straight shank is sufficient. These drop-shaped bead heads have the hole decentralized on the narrower side (off center). Consequently, the weight is distributed one-sided, so the nymphs will always sink down with the thick (heavy) side of the bead down and the hook point facing upwards. The tungsten jig off beads allow you to tie jig nymphs in the upside-down style, without a jig hook. The advantage is obvious: less loss of nymphs while fishing the bottom of the water, because the hook point is facing up the sky and not toward the bottom. Thanks to the small groove in the hole of the jig off bead, it can easily be threaded also on barbed hooks. These bead heads are perfect for the construction of wonderful nymphs, but they are equally suited for the realization of effective streamers, which will clearly work upside down. It's easy to tie fly pattern with the jig off beads: just thread the bead on the hook and block it with the tying thread in the way the thicker part is facing up (having previously blocked the hook in a traditional way with the hook point facing downwards in the vise). 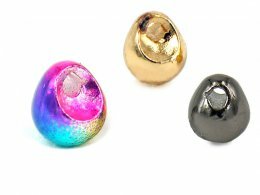 Jig off tungsten beads - GOLD - 10 pc. Jig off tungsten beads - SILVER - 10 pc. Jig off tungsten beads - BLACK NICKEL - 10 pc. Jig off tungsten beads - COPPER - 10 pc. Jig off tungsten beads - FLUO ORANGE - 10 pc. Jig off tungsten beads - RAINBOW - 10 pc.